We are wrapping up our current sessions of classes in the next two weeks. It has been a fun Fall session. We are going to have an open house Sunday November 8 at 1pm for anyone interested in taking comedy classes. Come out for a free master class in Improv, learn all about our programs, and meet some of our teachers. RSVP via this form now for more information!!! 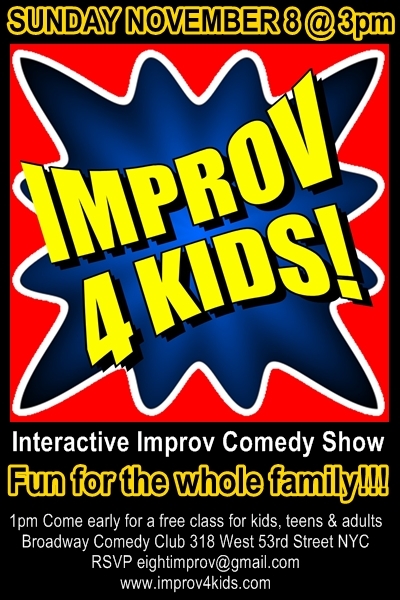 This entry was posted in EVENTS, Learn to Improvise and tagged 8, adult, afternoon, artist, child, class, college, comedy, faq, free, helo, help, improv, info, kid, learn, master, november, professional, sunday, teen, tween, workshop. Bookmark the permalink.